Still a family owned coaching business and based in Grantham today the emphasis is on holiday tours, day excursions, schools work and private hire. In years gone by a succession of bus services was operated too from the former base in Great Gonerby, as described in our article below. 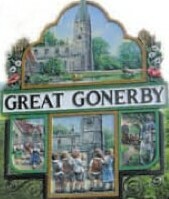 From the home village of Great Gonerby C W Pulfrey started in business in 1919 with a Chevrolet charabanc. This is the same village, just to the north of Grantham on the old line of the Great North Road, as the other Gonerby operator Simmons Reliance. Pulfrey was based at 1 High Street at the southern end of the village whilst Reliance was at 47 High Street at the northern end. With a fleet of modest size, reaching four vehicles in the post-war years, the primary axis of their bus operations was the route from Grantham northwards to Newark, passing through Gonerby and Claypole and the villages lying to the east of the A1 Great North Road. 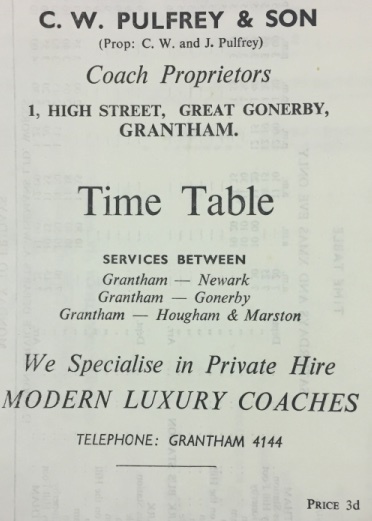 Until the early 1930s other private operators also provided timings on the section of route between Grantham and Great Gonerby: Whipple, Girdlestone and Reliance. After 1933 it was mainly Reliance. However Lincolnshire Road Car were also present in Grantham from 1928 and developed town and country routes from the town, including a daily service to Newark on a different route via Long Bennington (it had been started earlier by predecessor Silver Queen). In October 1932 one of the two routes of the Green Bus Service of G H Moyes of Long Bennington was taken over by Pulfrey (Grantham to Newark); Moyes other route from Long Bennington to Newark on Wednesday and Saturday passed to the Lincolnshire Road Car at the same time. Thus the principle axis of operation for Pulfreys was established along the Grantham via Great Gonerby, Marston and Claypole to Newark corridor to the east of the A1 trunk road, whilst the Road Car 22 route went a more westerly way between the two towns via Great Gonerby, Allington, Foston and Long Bennington. 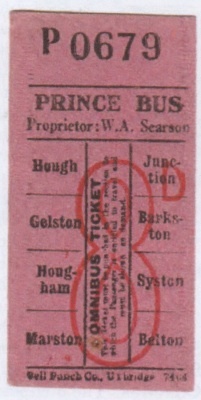 Pulfrey took over the long established Prince Bus Service of W A ("Billy") Searson & Sons of Barkston in 1969, with their routes from Brandon to Grantham via Hough-on-the-Hill, Marston, Barkston and Belton on Saturday; and Barkston to Newark via Hough, Brandon and Claypole on Wednesday; as well as a workers service Monday to Friday to the Ransomes factory in Newark. Two examples of the Prince Bus timetable can be found here. 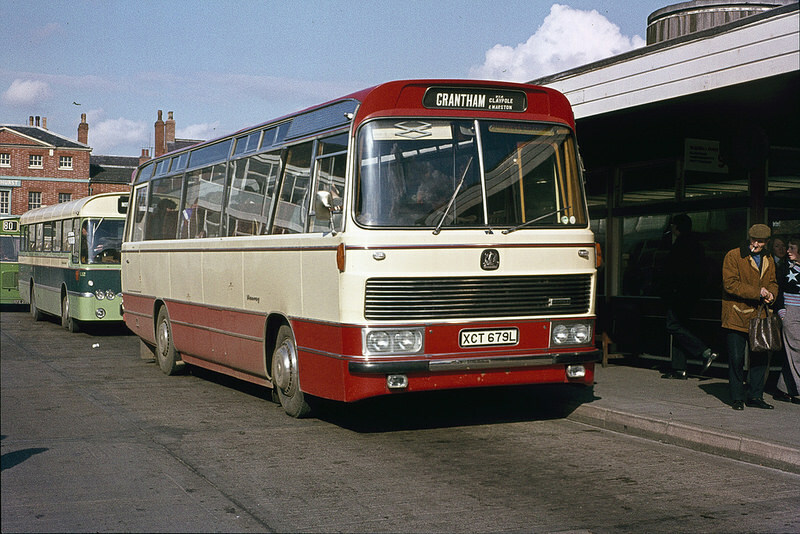 The Pulfrey bus services that were in operation in 1977 remained still primarily on the Grantham to Newark route via Marston, Hougham and Claypole, with variations; also works journeys for Ransomes in Newark and Aveling Barford in Grantham. The A1 was converted into a dual carriageway between Grantham and Newark during the 1960s and restrictions on turns on and off the main road caused changes in the pattern of bus service operation over the years: Grantham, Long Bennington and Newark were all by-passed by the A1 dual-carriageway. The year 1984 was an important one for local operators when the old bus station on St Peters Hill, Grantham (opened in 1932) was closed and replaced by the current facility in Wharf Road in March. As in many places deregulation of bus services in 1986 brought changes. Both Pulfrey and Reliance took advantage of the opportunities given by the new operating legislation. Pulfrey entered into competitive activity with two Grantham town services. One of the two routes was to the east of the town to Alma Park via Hill Avenue was operated by a Routemaster. There was also a circular to route to the west to Earlesfield via Dysart Road, Trent Road, Shaw Road and Springfield Road. The latter route was obliged to be single-deck operated because of low bridge clearances under the east coast main line railway. These services lasted perhaps a year. The operation of the Newark to Grantham route saw falling demand and it passed to Gash of Newark in October 1987 (competition had come to this route from Worthingtons Coaches of Collingham). By 1990 the ex-Pulfrey route from Grantham to Newark was being run by Road Car as route 75. Vehicle purchases were both new and second-hand and the Pulfrey fleet size in 1987 was seven vehicles. But the waxing and waning of the fortunes of business led to downsizing to one coach in September 1988. The business was now C W Pulfrey & Son; in 1991 it became Andrew and John Pulfrey. Over the years at the end of the 20th century Pulfrey's seemed to drop in and out of public bus service operation, eg in 1997 there were no such services, but they came back to this type of work again. Apart from the Routemaster mentioned above double-deckers have formed part of the Pulfrey's fleet for contract work, eg with a pair of ex-Derby Leyland Atlanteans with East Lancs bodies, A207TDO and A209TDO, both active in 2005. 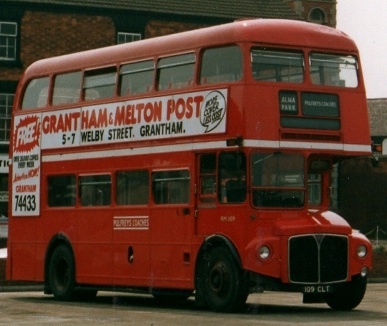 In 1987 Pulfreys operated this ex-London Routemaster 109CLT in short-lived competition on the Grantham town route to Alma Park via Hill Avenue. This vehicle also worked briefly for Poole Bay Services in Dorset. Liveries have varied with the years, sometimes red and cream, sometimes blue. Their base moved too, from Gonerby to Harlaxton Road in Grantham and subsequently to Foston, a village along the A1 north of Grantham. After the turn of the 21st century we find Pulfrey's running Grantham town service 3 to Barrowby Gate commercially until July 2005 when it passed to then new local majority operator Centrebus (previously the Barrowby Gate route had been operated by Reliance at some time). Then Pulfrey's also ran council supported services 605 from Grantham to Woolsthorpe and town service 620 to Sunningdale. These two routes continued until the county council funded changes for the expansion of the Centrebus network in and around Grantham in 2010, although in practice the 620 had been jointly operated with Centrebus since 2009. One bus sufficed to cover the workings of Pulfrey on both 605 and 620. 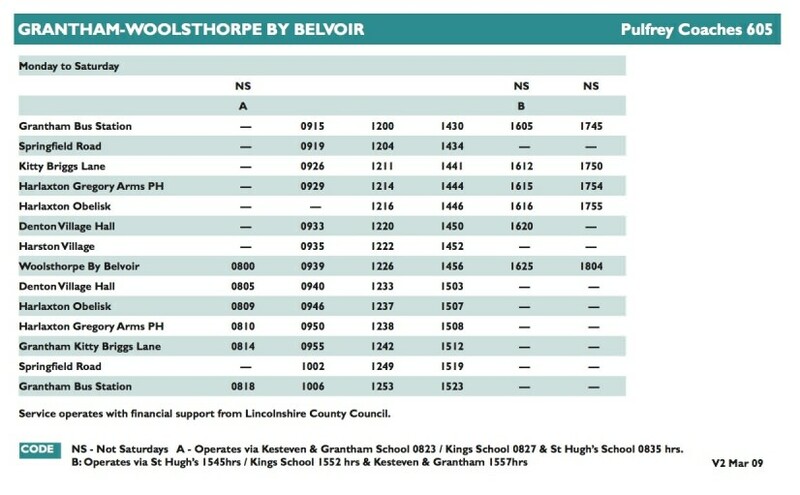 After that there again appeared to be little public bus service operation by Pulfrey except for a schoolday route from Harby, Plungar and Redmile to Grantham bus station. Then 5th January 2012 saw the introduction of a Thursday only return shoppers journey from Cropwell Bishop and Bingham to the Downtown and Boundary Mills superstores, which lie on the northern outskirts of Great Gonerby by the main A1 road. Almost home again! This shoppers route had its origins with Dunn-Line of Nottingham (to October 2010), then Veolia Transport England plc (to October 2011), then for a short period with West End Travel of Melton Mowbray until November 2011. ** The sharing of timings between Grantham and Great Gonerby sometimes led to unusual workings, eg in the 1980 timetable Pulfrey took people to work at Aveling Barford in the morning whilst Reliance brought them back at the end of the day. XCT 679L is a Bedford YRQ with Duple Viceroy Express coachwork which Pulfrey obtained new in 1972. It was photographed in Newark Bus Station whilst on service to Grantham via Claypole and Marston.